Readers, meet Genevieve the Octopus. The last time we went to the aquarium, Genevieve (the human child) pointed at a stuffed octopus the size of a body pillow and declared that she wanted to buy it. Since we bed-share (or "co-sleep"), a stuffed octopus the size of a sofa was completely out of the question. It's a snuggly arrangement. We went to the gift shop downstairs, and I showed Genevieve three or four appropriately sized octopuses she could choose from. 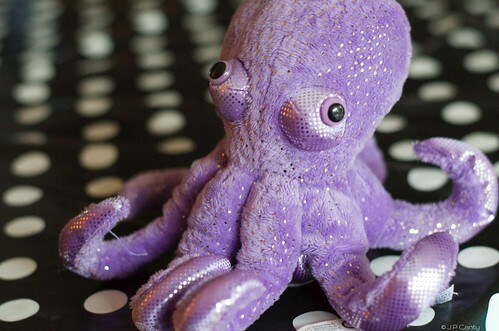 Predictably, she chose the purple, sparkly octopus . (I had lobbied for the more realistic looking one .) That is how Genevieve the Octopus joined our family. A few weeks later, SuperAndrew, Genevieve, and I went to get our flu shots together, with Genevieve the Octopus in tow. We went to a different Kaiser than normal because it was on our way that particular day, and the injection nurse was phenomenal- but that didn't stop Genevieve from screaming down the walls and terrifying the kids in the waiting room before anything had actually even happened. While Maria the Nurse was extremely skilled (I didn't feel anything when I got my shot), Genevieve made use of her excellent lungs and loud voice screaming encouraging things like, "TAKE ME AWAY FROM HERE!" and "MOMMY, SAVE ME!" I can only imagine what the poor kid in the waiting room thought was happening in there. Once it was finally done, we did the walk of shame from the injection room, through the pediatrics lobby, and out to our van, carrying a screaming, howling, crying Genevieve. It took us nearly an hour to calm her down enough to get in the car seat and go home. All of our nerves were frayed, and - if it hadn't been noon - it would have been wine o'clock when we got home. When we (finally) got home, Mom suggested taking Genevieve along the next time she needed to get bloodwork done. [Mom is on cardiac meds, and has to get coumadin levels checked fairly regularly. She is a human pincushion.] That way, Genevieve could watch Gramzie get a shot and be okay without having to get a shot herself. In the meantime, Genevieve the Octopus had mysteriously gone missing. Genevieve stopped screaming (just long enough for Nurse Maria to get the shot in) to look and see what I was talking about. "Genevieve, LOOK!" I said, "We found her! You must have dropped her the last time we were here, and she's been waiting for us to come and get her!" After a series of questions confirming our ownership of Genevieve the Octopus (because, after all, we couldn't run off all willy-nilly with someone else's purple, sparkly octopus), Genevieve and Genevieve the Octopus were reunited at last. I'm glad I didn't insist on the more traditional octopus; anybody could have left behind a regular octopus on accident. Thank goodness for her sparkly tentacles. So glad you found her! When I was a kid, my mom kept a stash of Beanie Babies hidden away, and we would get one whenever we got a shot. Now that I'm older and no longer get one after the doctor - even if I've been VERY GOOD, mind you - I'm calling shenanigans. Nice blog !! thanks for sharing the information. ISO 9001 Certification India. this blog is really nice and interested to read.